Paragonimus westermani is known as the human lung fluke; the adults measure about 10 x 6 mm. The oval ova have an operculum and are 80-120 by 45-70 µm. 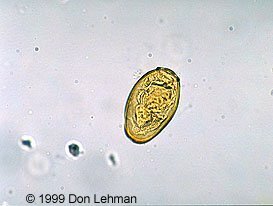 The yellowish-brown ova are operculated and found in sputum and feces.